These 5 simple unusual acne treatments have made a huge difference in reducing my acne. After using these methods daily, I have less breakouts and blackheads. Any time I skip one of them, like using the oil cleansing method for washing my face, I get a breakout. So, I know they are really helping! I’m always looking for ways to improve my skin and keep it clear. When the most conventional acne treatments didn’t work for me, I began trying some unusual acne treatments. I was surprised to find that the unusual acne treatments worked better than anything I’ve tried in the past. That is because they are getting to the cause of my acne instead of just treating it topically. I’ve tried many natural remedies such as baking soda, apple cider vinegar, tea tree oil, honey, lemon and cod liver oil, and I have worked with my naturopathic doctor to find out if my hormones are in balance and whether or not I was deficient in anything. Have I found the answer? With everything I do listed below I feel that I definitely cleared my skin. Here’s what I do now and 5 natural and unusual acne treatments, because it seems you have to experiment until you find out what works for you! Eat a real food based diet with fresh veggies with every meal. I also make daily green juice drinks and drink plenty of water. Take probiotics and eat fermented foods (The probiotic I take has 50 billion live cultures with many different strains). The more strains, the better! Take a real food based multi-vitamin. 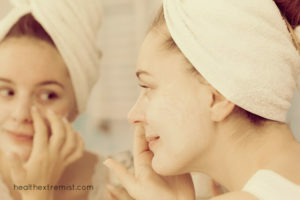 Use the Oil Cleansing Method – Instead of using soap, I use the oil cleansing method to wash my face (See Below). Use Castile Soap – Any time I do wash my face with soap, I use natural and mild castile soap. Face Masks – I love to use them whenever I can find the time. The ones I use are bentonite clay face masks and probiotic face masks. Once a week I also use an egg white face mask. It helps shrink my pores and minimize breakouts. Now that you know what I do, here are the unusual acne treatments. Of course, they are 100%natural! When I first started taking probiotics I thought that they would help improve leaky gut, but now I know that probiotics are not only good for the gut, but help reduce inflammation in many parts of the body, including the skin! Both internally and topically, probiotics have been found to help maintain and improve the microflora of the skin, and boost the skins natural balance and defense system. I take 50 billion live cultures, once a day before a meal. I also try to eat fermented foods, such as fermented sauerkraut at least once a day. You can also use probiotics topically on your face. Here is a good face mask. This is the easiest regimen ever! All you need is the guts to do it….. and this means don’t break down and wash your face or wear any makeup! I will have to admit that I haven’t tried this one, but my brother has. When he did it, he said his skin was never better. I can attest ….he looked really good!!! He stopped shaving for a while too and his skin was really nice underneath his stubble. The logic behind this is that your acne is caused by stripping your face of natural oils when you wash it. You might not even have acne, your face is just breaking out because you’re stripping your skin of its natural oils. You see, since puberty your skin has developed an “acid mantle” and this protective mantle not only protects the skin, but has the appropriate acidic pH of around 5.5. But when we wash our face, especially with toxic chemicals, we remove nature’s protective acid mantel and ruin the pH with drying products or even the chemicals in the water. For the caveman regimen all you do is leave your face alone… no washing or putting anything on your face (including makeup) and try not to touch your face or even get water on your face! If you want to remove dead skin every few weeks you can exfoliate with a cloth or wet muslin cloth (or your fingernails). Acne is one of the many symptoms of a sluggish thyroid and one possible root cause for acne. Low thyroid is very common, especially in women. The thyroid produces hormones for every cell in your body. Hypothyroidism can also cause lower levels of stomach acid which interferes with absorption of nutrients. Vitamin A is important for the skin and it may be possible you are not absorbing it properly. This is what I found out when I tested my blood. Be careful of thyroid tests though because physicians often don’t pick up on a thyroid problem because the results on the tests have too wide of a normal range often not picking up on many people that are slightly hypothyroid. Both my mom and I are considered normal according to the standard TSH test, but when the naturopathic doctor got the results we found out we were slightly hypothyroid. Get your thyroid tested (blood test), which includes a full panel and see a naturopathic doctor. If you are hypothyroid chances are you may have other symptoms, such as being tired all the time or sensitive to cold and you will feel much better once you take natural supplements such as desiccated hormone supplement or use other natural methods. Taking a few tablespoons of coconut oil a day is a great way to boost your thyroid. How often should you poop? Did you know this may be causing your acne? Well, you should be going every day. Putting it simply, when you don’t go every day the poop sits in your intestines longer and the bad bacteria and toxins can be released back into the body causing acne! Ugh! Make sure you are getting enough magnesium. I take 500 mg 2 times a day and sometimes I even soak in magnesium flakes. Don’t worry about taking too much magnesium, if you are, then your poop will become too liquidy and you can reduce the amount you’re taking. Another way to improve acne is through the gut. If you improve the flora in your gut then you can get things moving properly. I love this method and use it faithfully every morning. I’m so happy I tried this after reading about unusual acne treatments. This method is based on the same theory as the caveman regimen, which is that you don’t want to strip the face too much of its natural protective layer if possible. But putting oil on your face? Yes, actually using oil won’t strip the good oils on your face! Another good thing is that it is lubricating and your face won’t be dry and irritated after. The important point is that applying oil on your face will remove the built up oil. Don’t worry about using oil though, it won’t clog your pores! *Jojoba oil and hempseed oil are rated as very low to non-comedogenic oils. You can use other oils, but be careful because some other ones may clog pores. I did this once with coconut oil and my skin broke out. I also use hempseed oil as a natural moisturizer too because it is hydrating, yet won’t clog my pores. 1. Make sure you don’t have any makeup or products on your skin. 2. Put about 1 teaspoon of jojoba oil in your hand. 3. Rub the oil mixture gently around all areas of your face. I do this for about 1 minute to make sure it is thoroughly absorbing. 4. Take one washcloth and get it wet with hot water (but don’t burn yourself) and wring it out so it’s not dripping. 5. Place the wash cloth over your face and leave it on for at least 2 minutes. This creates a steam. Then remove the cloth. 6. Take the second washcloth and wet it with lukewarm water, ring it out so it’s not dripping and wipe your face with it. This removes the excess oil sitting on your skin. *Give your skin a minute or two to air dry and it will feel super clean and really moisturized! Have you tried any of these unusual acne treatments? Previous Post: « 3 Ways to Grow Longer Eyelashes Naturally – My lashes were longer in 3 months! What do you use to remove make up then? Coconut oil is great for removing makeup! I bought the butter oil/fermented cod liver oil blend. Do you recommend this over just the cod liver oil? And how much should I be taking a day? Thanks so much!!! I love your post and all the great info! Hi Becca, they’re both great! I would take either one. I take the FCLO plain because I am sensitive to dairy. I take 2 tablespoons a day, which is higher than the typical dose recommended -that’s 2 teaspoons a day. I’ve also been taking calm plus calcium. 3 tsp/day which has 210mg of calcium and 320mg of magnesium. Should I take this much twice per day or how would you suggest it? Ty!!! I would check with your doctor or a naturopath if possible. I currently take a supplement called Osteo-support, which has 500mg calcium and 250mg magnesium. I also do foot baths with magnesium flakes a few times a week. Thanks for great stuffs LORI, but i got a qn? just this year i decided to change my lifestyle and diet plus applying benzoyl peroxide 5% direct on ma face and as i see it, it really helps…. i stopped dairy products and refined sugar and thank Heavens am really feeling great as my skin really improves though there is a problem! what if i stop benzoyl peroxide? will i breakout again?! b’coz i’ve been hearing stuffs like that. thanks again and i love this blog. Hi Jacki, I used benzoyl peroxide as a teenager. 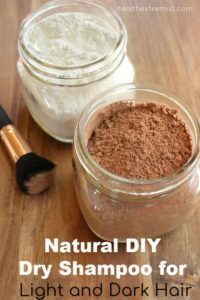 When I stopped using it, I substituted it for all natural remedies..primarily a baking soda face mask. I actually found the baking soda face mask to work better than benzoyl peroxide.